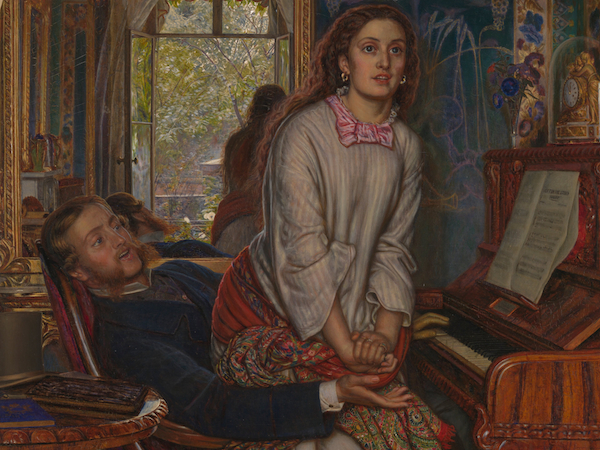 William Holman Hunt’s painting, The Awakening Conscience, addresses the common Victorian narrative of the fallen woman (for more about this subject, see Stanhope’s Thoughts of the Past). 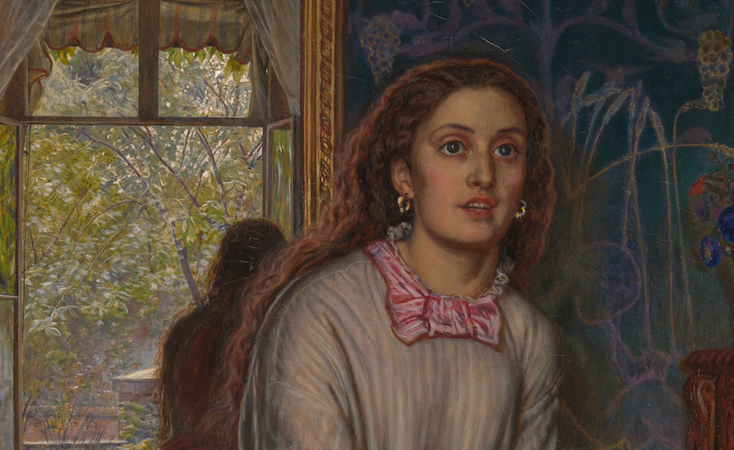 Trapped in a newly decorated interior, Hunt’s heroine at first appears to be a stereotype of the age, a young unmarried woman engaged in an illicit liaison with her lover. This is made clear by the fact that she is partially undressed in the presence of a clothed man and wears no wedding ring. However, Hunt offers a new twist on this story. 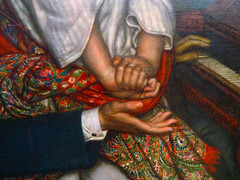 The young woman springs up from her lover’s lap. She is reminded of her country roots by the music the man plays (the sheet music to Thomas Moore’s Oft in the Stilly Night sits on the piano), causing her to have an awakening prick of conscience. 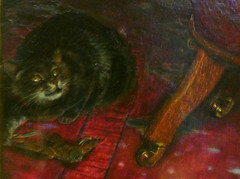 The symbolism of the picture makes her situation as a kept woman clear—the enclosed interior, the cat playing with a bird under the chair, and the man’s one discarded glove on the floor all speak to the precarious position the woman has found herself in. However, as she stands up, a ray of light illuminates her from behind, almost like a halo, offering the viewer hope that she may yet find the strength to redeem herself. 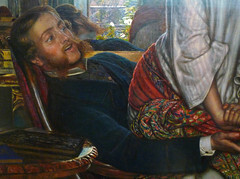 The theme of the fallen woman was popular in Victorian art, echoing the prevalence of prostitution in Victorian society. Hunt’s redemptive message is unusual when compared to other examples of this theme. 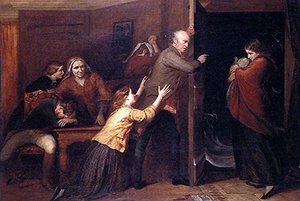 For example, Richard Redgrave’s The Outcast (1851), which shows a young unwed mother and her baby being cast out into the snow by her disgraced father, while the rest of her family pleads for mercy. Countless other paintings of the period emphasize the perils of stepping outside the bounds of acceptable morality with the typical conclusion to the story being that the woman is ostracized, and inevitably, suffers a premature death. By contrast, Hunt offers the viewer the hope that the young woman in his painting is truly repentant and can ultimately reclaim her life. 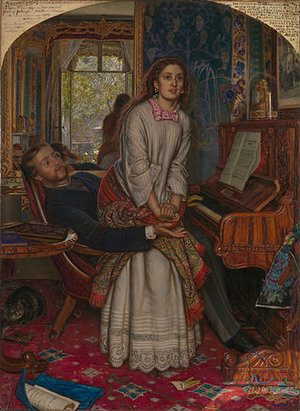 The Awakening Conscience is one of the few Pre-Raphaelite paintings to deal with a subject from contemporary life, but it still retains the truth to nature and attention to detail common to the style. 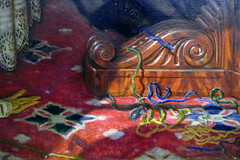 The texture of the carpet, the reflection in the mirror behind the girl and the carvings of the furniture all speak to to Hunt’s unwavering belief that the artist should recreate the scene as closely as possible, and paint from direct observation. To do that, he hired a room in the neighborhood of St. John’s Wood. 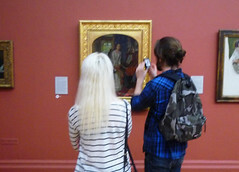 The picture was first exhibited at the Royal Academy in 1854, and unfortunately for Hunt, met with a mixed reception. 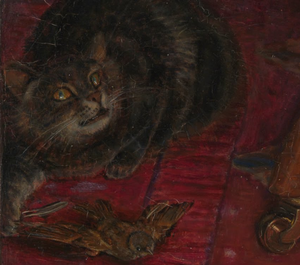 While Ruskin praised the attention to detail, many critics disliked the subject of the painting and ignored the more positive spiritual message. For Hunt, the moral of the story was an important element in any of his subjects. He was a deeply religious man and committed to the principles of the Pre-Raphaelite Brotherhood and John Ruskin. In fact, shortly after this painting was completed, Hunt embarked on a journey to the Holy Land, convinced that in order to paint religious subjects, he had to go to the actual source for inspiration. The fact that a trip to the Holy Land was a difficult, expensive and dangerous journey at the time was immaterial to him. The Awakening Conscience is an unconventional approach to a common subject. 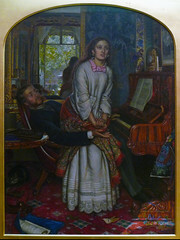 Hunt’s work reflects the ideal of Christian charity espoused in theory by many Victorians, but not exactly put into practice when dealing with the issue of the fallen woman. While others emphasized the consequences of one’s actions as a way of discouraging inappropriate behavior, Hunt maintained that the truly repentant can change their lives. 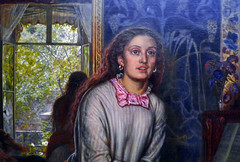 Cite this page as: Dr. Rebecca Jeffrey Easby, "William Holman Hunt, The Awakening Conscience," in Smarthistory, August 9, 2015, accessed April 23, 2019, https://smarthistory.org/hunt-the-awakening-conscience/.